The Kelowna golf season in the Okanagan Valley is the envy of Canada. Over 2,000 hours of sun every year makes it one of the longest, and driest, golf seasons in the country. Several of the tee boxes offer incredible views of the lake, mountains, vineyards and orchards, rolling hills and the cityscapes below. 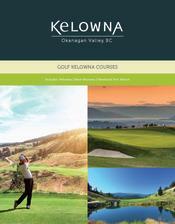 And, we&apos;ve got golf challenges in Kelowna for every skill level. Want to practice your swing? Check out this great practice facility by clicking here.